Lasley was not active for any games during the 2018 season. Analysis: The rookie out of UCLA managed to crack the 53-man roster but spent the entire season as an inactive. He'll now get a full offseason under his belt to continue to learn the offense. With John Brown slated to enter free agency, there's a possibility of an expanded role for Lasley in 2019. Lasley (hamstring) doesn't carry an injury designation into Sunday's game against the Steelers. Analysis: Lasley popped up on the Ravens' injury report Thursday, when a hamstring issue limited his involvement in practice. Whatever the rookie was able to do in Friday's session was apparently enough for him to avoid a questionable status heading into the weekend. Lasley hasn't been active at any point this season and that seems unlikely to change Sunday with all four of the receivers above him on the depth chart currently healthy. Lasley (hamstring) was a limited participant in Thursday's practice, Jamison Hensley of ESPN.com reports. 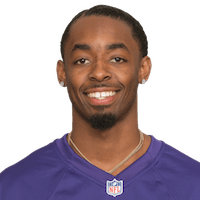 Analysis: Lasley was a surprise addition to Baltimore's injury report after practicing without issue to begin the week. The rookie fifth-round pick appears to be nursing a hamstring injury of undisclosed severity, and his participation in the final practice of Week 9 should help clarify his chances of suiting up against the Steelers on Sunday. If Lasley is unable to go, Cyrus Jones will slot in as the Ravens' top return option. There are no videos available for Jordan Lasley. Click here to view all videos.